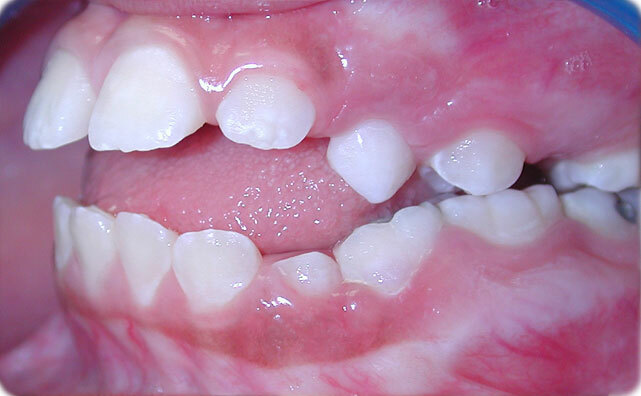 Anterior crossbite is a common problem in that presents itself in mixed dentition when the upper adult anterior teeth erupt behind the lower anterior teeth. It may be skeletal or dental in nature or a combination of both. An orthodontic consultation is recommended, because the crossbite could cause premature attrition (wear) of the teeth requiring a dental restoration or, if less severe, an enamoplasty (reshaping) of the incisal edge to hide the irregular tooth edge. 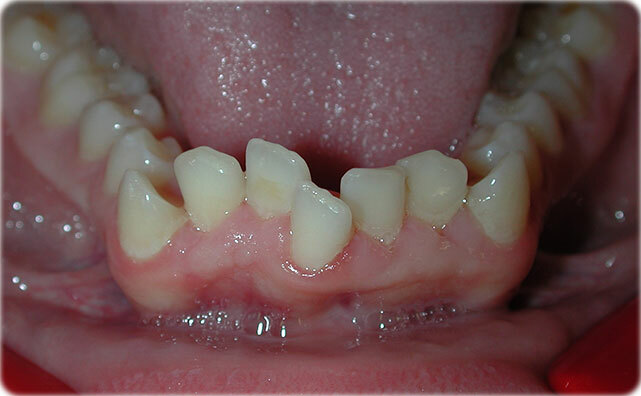 A skeletal crossbite usually involves several anterior teeth and is due to dysplasia (abnormal growth) of the upper and/or lower jaws. Most skeletal crossbites should be managed early between 8 and 10 years of age. A supernumerary tooth is an extra tooth. They can occur anywhere within either jaw but are most common in the upper anterior. 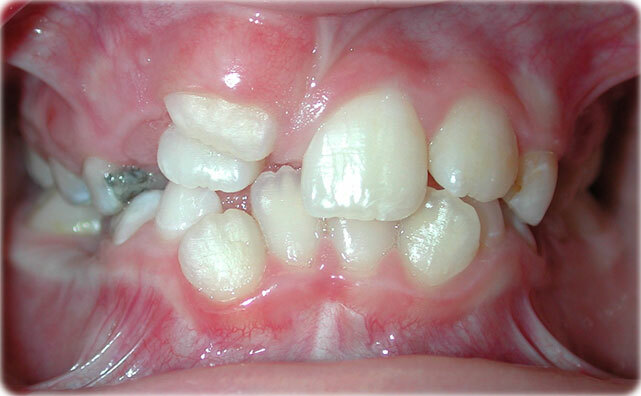 When an extra tooth occurs in the midline of the upper front teeth, it is called a mesiodens. The person in the photograph to the right has an extra lower incisor. Some individuals may have several. Many supernumerary teeth are discovered on an X-ray. 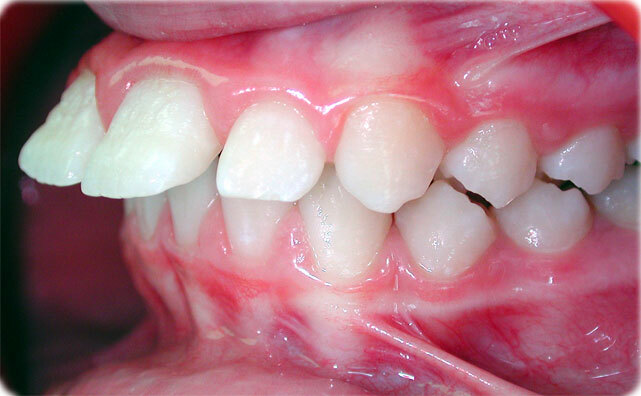 These extra teeth can cause impaction of other teeth, or when they don’t, they will displace the surrounding teeth (displayed as crowding) in the area in which they are found. These extra teeth almost always will need to be extracted. See Dr. Wirant as soon as this situation presents itself so that he can make a proper treatment plan. A frenum is a small fold of tissue that runs from the inside of your lips and cheeks to your tongue and gums. There are several of these tissue membranes in your mouth. This tissue may have one of its insertion points between the upper or lower anterior teeth leaving a space in the midline. It can cause space to develop between the front teeth. It may be beneficial to close this space prior to a frenectomy, a procedure that removes some of the tissue so that the space will stay closed or can be closed in the event that the frenum is rather large or fibrous in composition. 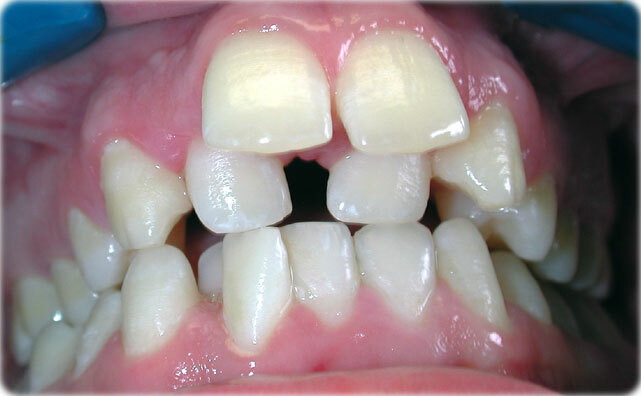 The amount of vertical overlap of the anterior teeth is the “overbite.” Overjet (buckteeth) is the horizontal distance between the upper and lower anterior teeth. The overbite is either open, normal, or deep. In a very severe deep bite case with a large overjet (buckteeth), the lower anterior teeth may actually bite into the palatal tissues (the roof of the mouth). A wide variation of problems can result from deep bites including trauma to the palatal tissue and worn or chipped teeth. 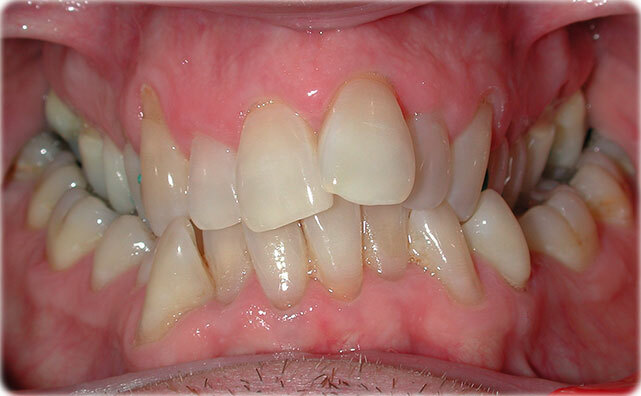 The individual in the photo to the right has a deep bite with retroclined (tipped backwards) central incisors. A deep bite should be corrected with orthodontic treatment. 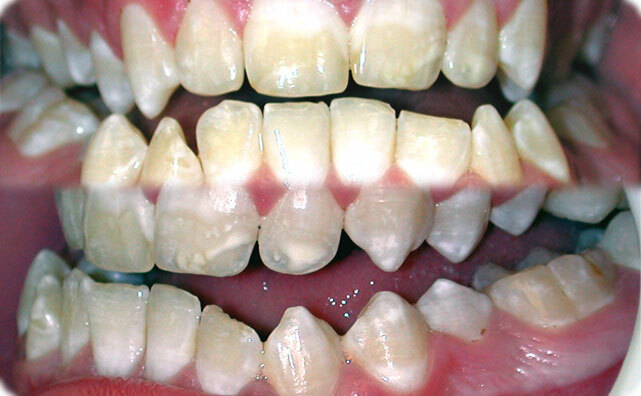 A crossbite occurs when the teeth in upper jaw fail to properly match up with teeth in the lower jaw. 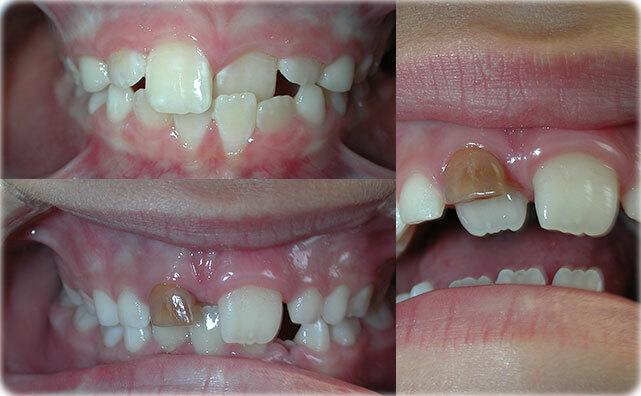 It is very common to correct a posterior crossbite with a palatal expander at an early age (before 10 years of age) while the patient is still growing. 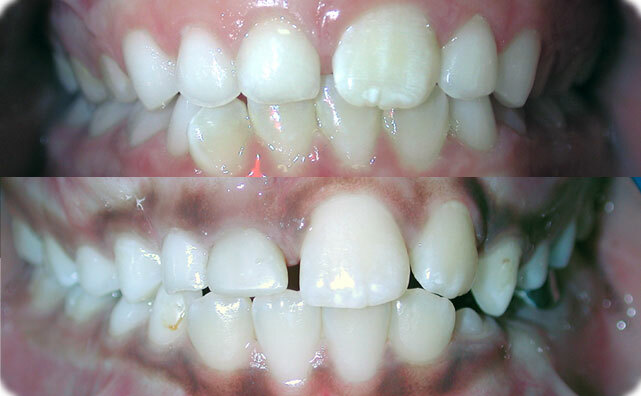 A skeletal open bite, as seen in the photo on the right, is not usually corrected with orthodontics (braces) alone. It usually involves a combination of braces and orthognathic surgery (corrective jaw surgery). 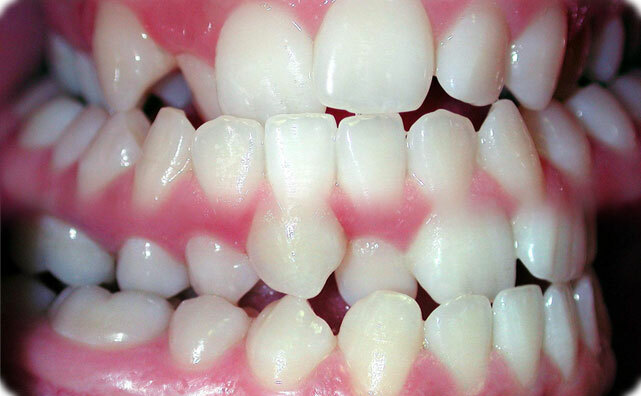 This patient’s teeth only touch on the second molars. Because this individual cannot chew food properly, this is a choking hazard. Thumb- and digit-sucking habits and tongue “thrust” or, more likely, tongue position can cause a gap between the upper and lower teeth. Any thumb- or finger-sucking habit should be eliminated as soon as possible (usually by 7 years of age). Once this habit is eliminated, an open bite will correct a great deal without any further treatment if the individual is still young and growing. Dr. Wirant has a fixed appliance that can help a patient overcome this habit. Another product that is excellent in stopping thumb-sucking is Mavala Stop (for children over 3). 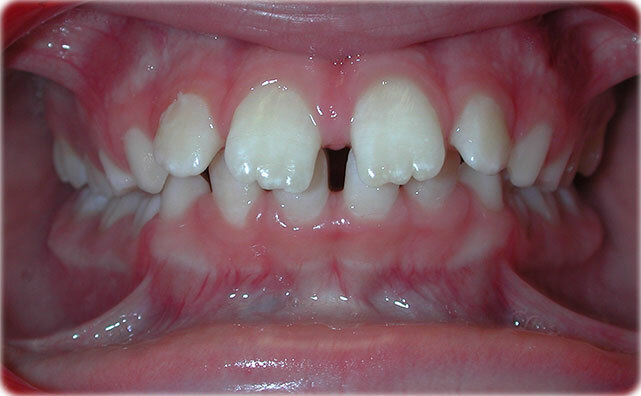 The clinical sign that there may be an impacted anterior tooth is when the left and right sides of the mouth differ (such as over-retained baby teeth on one side) and have been that way for more than a few months. An X-ray will be necessary to determine if an issue is really present. Severe crowding can be treated before it gets to the stage in the teen years as shown in the photo on the right. 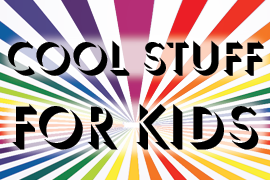 The American Association of Orthodontists recommends that children be seen by an orthodontist around age 7. Orthodontic treatment at an early age may not actually involve braces, but could instead involve watching the patient’s growth and development and the timely extraction of baby or adult teeth (Guidance of Eruption Protocol -link AAO materials) so problems like this are minimized and managed. Not every person may benefit from interceptive orthodontic treatment, but clearly there are those who should seek out an orthodontist. 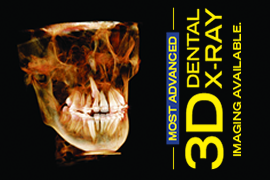 3-D X-ray imaging in a situation such as this is crucial. This is actually an adolescent’s bite in the photo on the right. This was not caused by a habit such as thumb-sucking and should have been managed much earlier by an orthodontist. 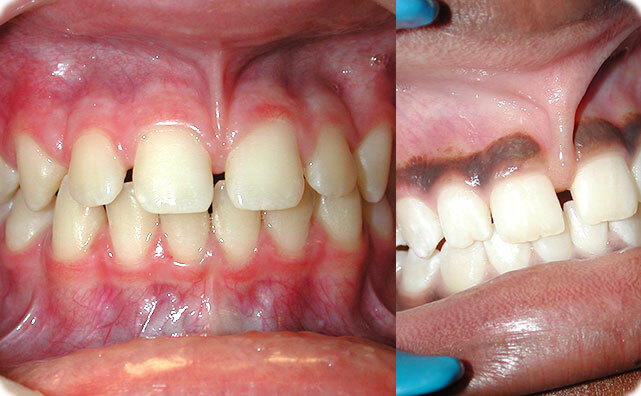 The patient has had this issue for around 5 years and is lucky to have not injured her teeth or lips. Shown here is an adult patient with a narrow upper jaw that could have been treated non-surgically with an expander before adolescence for this skeletal issue. 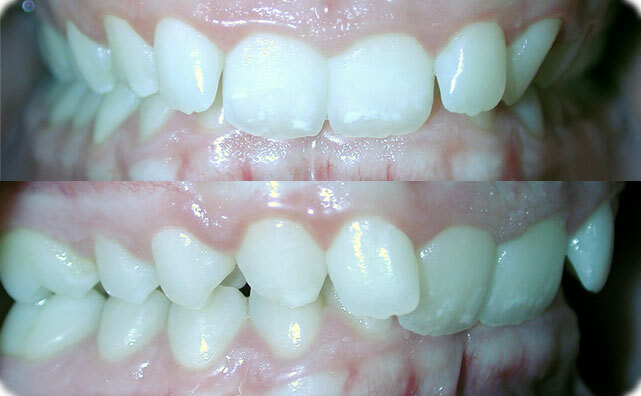 This patient had surgically assisted rapid palatal expansion (SARPE). Here is another adult patient that had SARPE. Here is a patient that declined SARPE and settled for a compromised orthodontic result due to the skeletal nature of the problem not being addressed. There are many examples of young patients found in this chart who had rapid palatal expansion (RPE) while the maxillary (upper jaw) palatal suture is still patent (capable of growth). 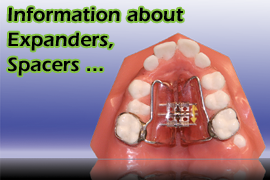 If the spacing is very severe, one might consider braces earlier than later to help prevent any possible injury. Sometimes when children horse around, their teeth can get snagged on clothing and subsequently become avulsed (knocked out).